Theresa is the only hybrid child of an Angel and a Dragon. 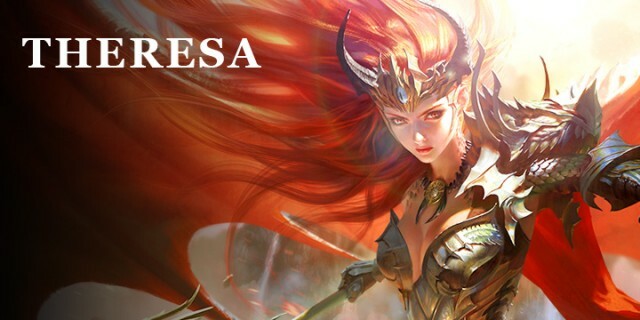 She is granddaughter to the Prime Angel and Dragon King Ulysses. As a child of two ancient rival races, her life is filled with conflict and uncertainty. Since her birth, her heritage has kept her alienated from both races. Her mother was forced to raise Theresa alone in isolation. Theresa's childhood was responsible for her independant and rebellious personality. As Theresa grew up, her power began to grow, a result of having both Angel and Dragon blood. Her might far surpassed other Angels. All three Factions wanted her on their side, but the torment she received during her youth was still fresh on her mind. Theresa turned a blind eye to the Faction's requests. It was not until the Prime Evils were awakened did she join the League of Angels.